My dear son accompanied me as well. He would watch Growtopia or Gundam-in-making in Youtube and lying down beside me. 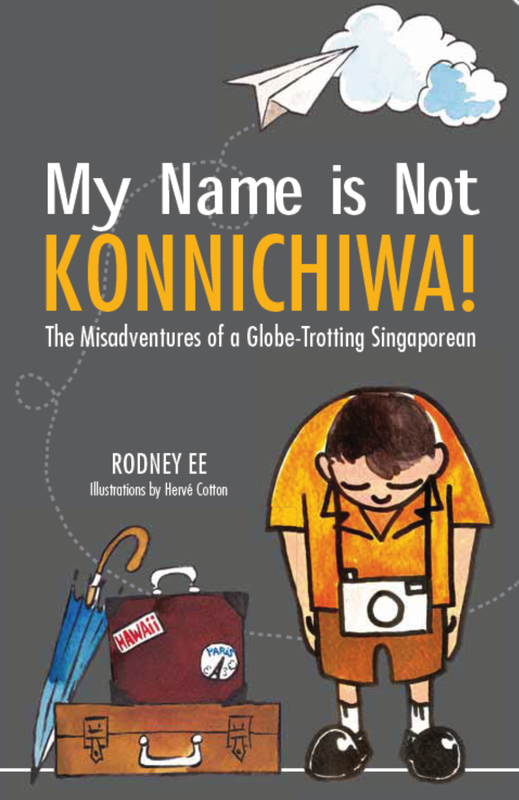 Sometimes I introduced the interesting book to him, like this one: “My name is not Konnichiwa” – written by Rodney Ee, a Singaporean born globetrotter. This book consists of short travelogue – all of what he experienced when traveled from one country to another. It gave us a view of what the country looked like, what culture the country had, what you would expect when it came to shop – reminded me of the interesting carpet-seller story, and so on. 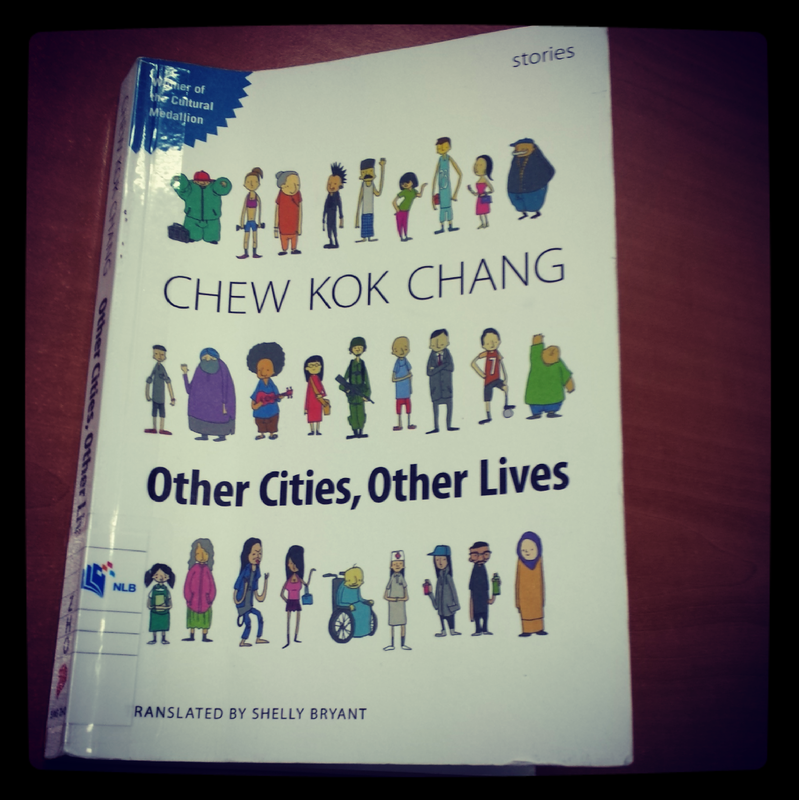 I tried to introduce him another book by Singaporean author born in 1934, Chew Kok Chang, and translated by Shelly Bryant, titled “Other Cities, Other Lives”. It was another book with collection of short stories. Some stories related to what people (this context referred to Singaporean) experienced while traveling to China (using travel agent service), some was about how parents in Singapore treated his only and beloved son, some about their perception and unexpected maid that they hired, and so on. It’s a mixed story at different places, but the language used was so simple. And Mr Chew loved to put in some Chinese poet into the story (translated into English). It made me thinking that everyone should be able to write the book based on their experience. They just had to keep a note on every detail of the experience that they had. Hm…. *thinking. Most of stories reflected the Singaporean way of living including their feeling, their concerns, their expectation, and so on. If you wanted to know more about Singapore, this book is a good choice to read. It reminds me of “Then I Saw Her Face” – a short story collection of Bhutanese lives written by Ngawang Phuntsho. It’s more or less like that. Too bad my son found it boring. Perhaps it’s because he preferred reading books with lots of pictures, comical type of books. But I was glad that he purposely visited the library the day after he rejected reading this book and borrowed two Asterix comics, as long as he developed reading habit for the books of his own choice. 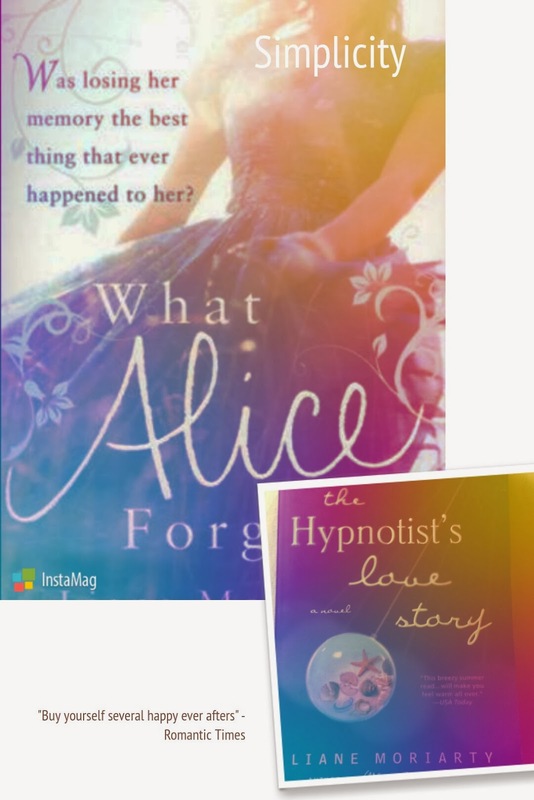 The next two books I want to introduce were “The Hypnotist’s Love Story” and “What Alice Forgot”, both written by an Australian author, Liane Moriarty. At first, my friend recommended me to read one of her novels titled “The Husband’s Secret”. However, I couldn’t find it in the library. Perhaps the book was too good to read. Every time I checked, the books were on loan and even on reserved. But when I browsed to the shelf, I found her other books. I read “The Hypnotist’s Love Story” first and immediately fell in love with the story. The story was about Ellen, the hypnotist, who fell in love with a man, whose wife had passed away, having one son, plus an ex-girlfriend who was a stalker. But Ellen was so positive overcoming what came to her life and the story was so smooth and really nice to read. Once finished reading it, I searched for other books by her. That’s how I found “What Alice Forgot”. This book was about Alice, a woman in her 39, who fell down while exercising in gym, knocked her head, and when she woke up, she thought she was only 29 and pregnant. She had forgotten what had happened during the past 10 years and was only surprised that she didn’t even know that she had already had three children and was going to divorce with the man that she loved. The day when my son borrowed his Asterix comics in the library, I saw both of my sister-in-laws in the library too. The elder one was collecting her reserved book, titled “The Monk Who Sold His Ferrari” by Robin Sharma while the younger one was trying to find the book that she loved reading. Wow! That’s good news as usually I saw the elder one watching her favorite Hong Kong drama on her mobile phone or Ipad and the younger one watching TV after finished work. Never once I saw them holding book or reading book before. So, when knowing that they started reading books too lately made me surprise, and happy too! Imagine! When I recommended the two books above to the elder sister-in-law, she told me that she almost bought it before. She didn’t, BUT she bought “The Husband’s Secret” instead. Wohooo!!! Now I can read that book without having to wait for the book to be available on the library! That’s good news, wasn’t it? 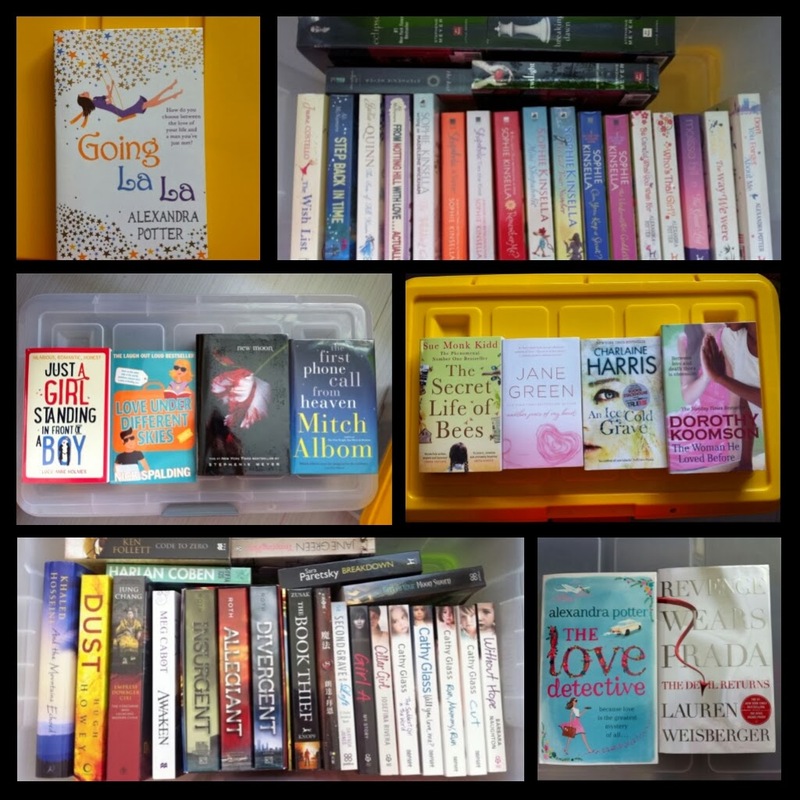 Little did I know that the elder sister-in-law had great collections of books too at her home. 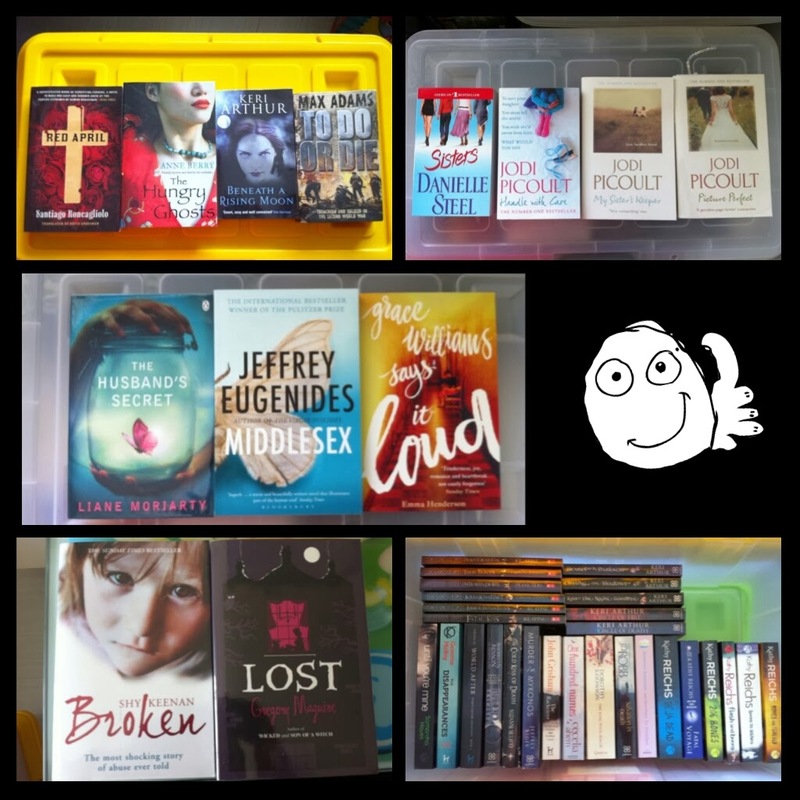 Just an update, I was shocked to find out that she really had great collections of books!!! Look at the pictures below. Yalama! The younger sister-in-law was looking for inspirational book so that she could learn more things about life. Wow!!! That was also another breakthrough for her. She thought of upgrading herself with more knowledge and be wiser. Good job! Keep it up both of you! 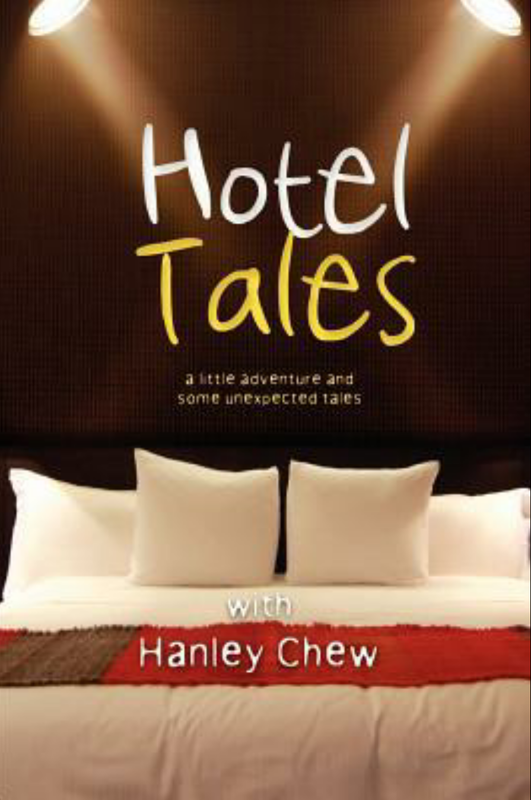 The other book I read was “Hotel Tales” written by Hanley Chew. As I have worked in the hotel for many years, I found many familiar stories in this book. It was compilation of things experienced personally by many hoteliers such as: CEOs, managers, public relations officers, the front desk, security, F&B and housekeeping staff of various hotels in Asia. If you’d love to know about what happened behind its outer layer of the building, this book was definitely giving you deeper information based on the real situation. Other hotel related book that you could read was “Heads in Beds” by Jacob Tomsky but his experience was on what’s happening in America. 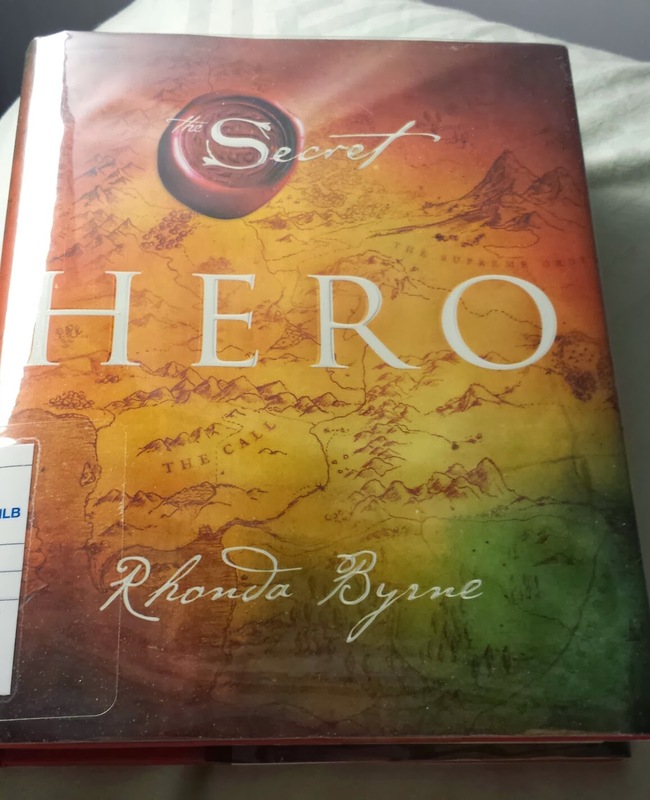 I’m reading half way “The Hero”, a new published book written by Rhonda Byrne. It's such a tiring weekend, but it was great! :) My Bhutanese friend's friends came to Singapore yesterday, Sithar and Palden. They came all the way from Phuentsholing and Thimphu. 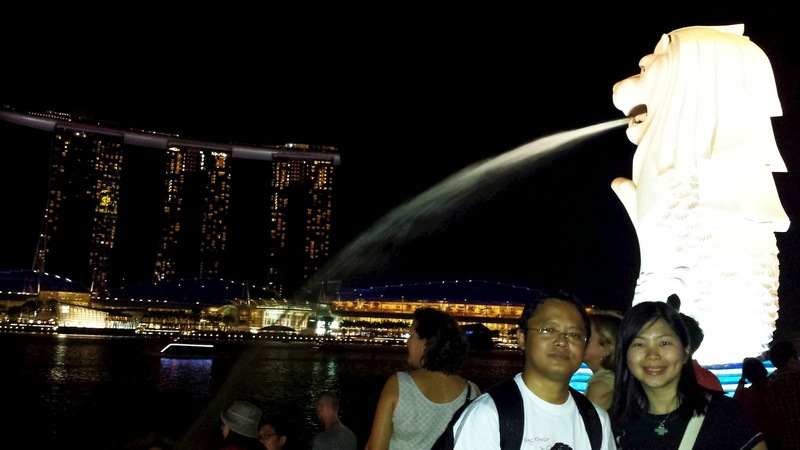 It was Palden's first time visiting Singapore, while it was third time for Sithar. Since I was free and they only had few friends in Singapore, I offered them if they wanted to visit the Singapore Zoo and River Safari today. They both agreed. And the night before, which was yesterday, three of us met for the very first time in Chinatown. At first I thought of bringing them to have dim sum. But then I remembered that there was one of the best chicken rice stalls in Singapore that was located at Maxwell hawker center (nearby Chinatown). I just thought that they should try that, better than having a regular dim sum. 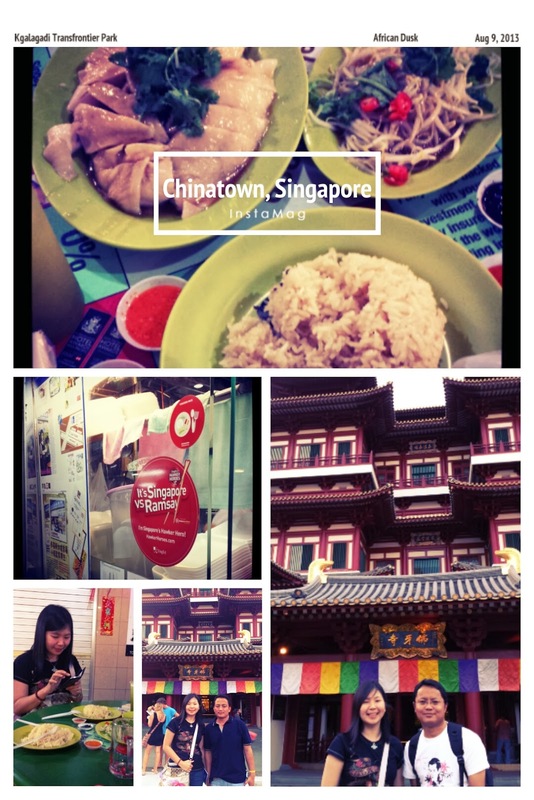 Therefore, we went to have chicken rice instead and just before that, we stopped by at Buddha Tooth Relic Temple or Fo Ya Shi for a prayer. They became more famous after their Boss, Madam Foo Kui Lian's recipe defeated the Scottish celebrity Chef, Gordon Ramsay, whose restaurants had been awarded 15 Michelin stars in total, who came to Singapore last year July and tried to compete his cook with many other Singaporean famous local dishes' owners. You can read more about the competition here. After dinner, I suggested them to walk to Clarke Quay area. It wasn't far from there. By the time we walked, the sky had turned dark and the wind blew comfortably. We walked through the riverside where many restaurants were built. There was live band played in some pub (we could stand outside the pub to listen and enjoy the music), Turkish ice cream seller teased his customer again and again when delivering his ice cream and there was also scream heard from those people who were taking the GX-5 Extreme Swing. It was so lively and vibrant. Three of us enjoyed it so much. It was crowded everywhere, mostly by tourists from all over the world. From the Merlion Park, we could see the Marina Bay Sands (shown on the photo above) - a combination of hotels, casino, restaurants, bar, infinity swimming pool, shopping mall, etc., Singapore flyer, MBFC (Marina Bay Financial Center), and many more. Once done we walked back to Clarke Quay area. This time, we stopped by at one bar, took a rest and had a cool Tiger beer to ease our thirst (pineapple juice for Palden since he had quit drinking). We sat just next to the river, had a chit chat and relaxed. After that we went back to have a good rest. 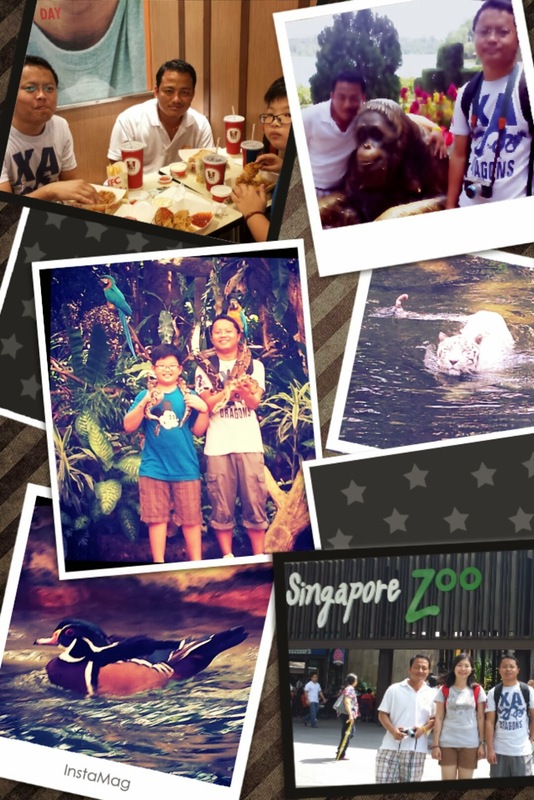 This morning, we met at Ang Mo Kio MRT station and took bus together to the Zoo. 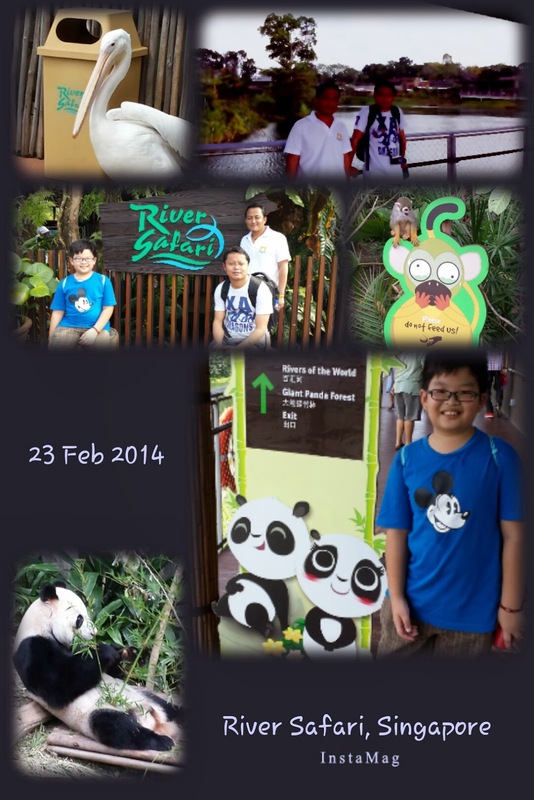 We visited the River Safari first. Too bad the boat wasn't available as it's been fully booked. We had to walk instead to see the animals and there weren't much animals displayed. Within one hour time, we almost finished browsing, except for the Kai Kai and Jia Jia (the two pandas that were brought all the way from China). The queue was horrible!!! 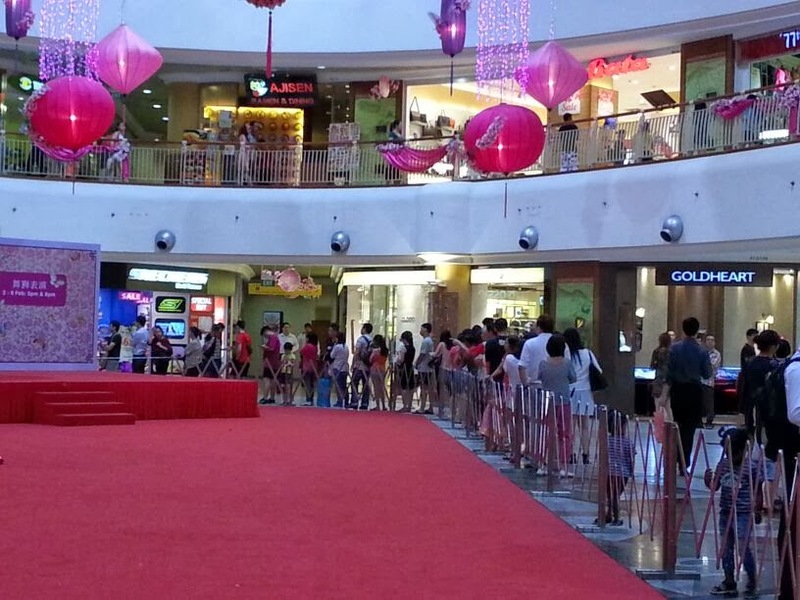 The staff said it would take us an hour to wait and she advised us to come back at 4 pm where the crowd would be lesser. We didn't want to waste our time so we decided to go to the Zoo first and later on we would return back to the River Safari only to see them. Kai Kai was enjoying bamboo leaves when we visited him. It's said that each Panda ate 20 kg of bamboo every day, which was equivalent to the weight of 100 bowls of rice!!! Wow!!! He ate some carrots too. Oh.. finally we finished visiting both places!!! We went back to Ang Mo Kio MRT station by bus. After that we separated. Sithar and Palden took MRT back to the hotel where they stayed while my son and I took bus back home. I was tired of walking but I enjoyed the visit so much and happy too being able to bring them around. I only hoped that they enjoyed it as well and not felt tortured by me hahahaha..... Oklah, it's time to take a good rest now. Have a great week ahead everyone!! As for Sithar and Palden, wish you both have a fruitful and more enjoyable experience in Singapore!!! Have a great time and take care!! For those using PC to open my blog, do you notice that there is a music being played automatically? If you are interested, you can also do the same. But for downloading the music, I think I still managed to do it. First, you can go to www.cincopa.com Go and sign up if you haven't done it before. Second, under the "Solutions" tab, click the "Blogger Widget" - "Video and Music". Third, select the skin. In this blog, I chose: "Music player auto start" Click "Use this skin" (You can choose whatever skin type that you like) then click "Save and continue"
Fourth, upload the files, which is where you store the music that you want it to be played on your blog. After uploading, click "Continue"
Fifth, add text (set caption and description) if you want to, and click "Continue"
Sixth, it will be ready to be embed. You can find the "Blogger" button under "Other", then click "Copy". Once you copied, you go back to your blogger application and choose the Layout. Choose where you want this music player to be shown in your blog, then click "Add a widget". Click the + sign next to "Html/Java Script". Under "Content" box, paste the one you just copied from Cincopa, and save. Click "Save arrangement" button and view your blog to check if the music player has been installed properly and whether the music has been played automatically when you opened up your blog. Do you know that helping others will make you happy? 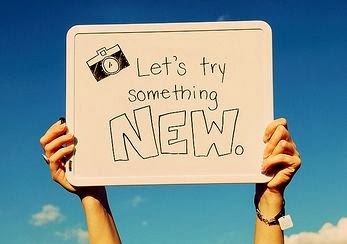 I bet you do :) You would have experienced it yourself into your life. Let each of us contemplate for a while. Think! When was the last time you helped someone? Who did you help? Why did you help? Was it a sudden decision to help? Or was it done after having a long consideration whether to help or not? Then, think deeply, what was the response of the person that you helped? Would the person be grateful? Or would they take your help for granted? (Well, not everyone would appreciate your help though! This is a real world, after all!) And what would be your reaction? How did you feel after helping them? It’s in the middle of the week still. However, no matter what day it is, how good or bad your mood is, you can help anyone at any time. It's not necessary to help others in monetary terms. Even a single smile on your face would help brighten up someone’s life. So, keep helping others at any way. Help someone to open the door, press on the lift button so that they can go inside the lift safely, help someone carry the items when you see them carrying too much, pick up and alert someone (the owner) when you see their wallet or hand phone dropped on the floor (you must probably have ever felt how devastated it was when you lost your wallet or hand phone, mustn’t you? ), and many more. Well, it is supposed "to make 2010 the best year yet". However, it's better late than nothing at all, isn't it? 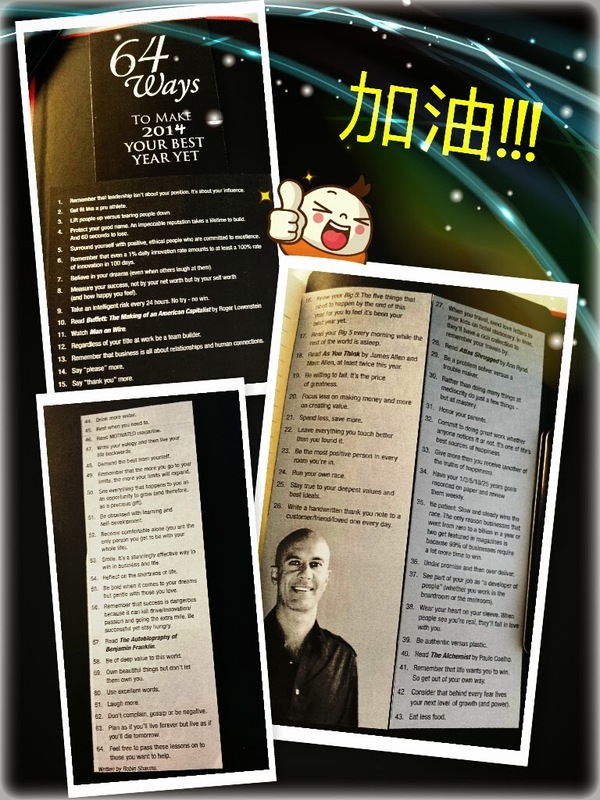 In fact, I can use it as a guide for many years to come as I doubt that I can do it all within one year and somehow there are some points that are good if it is to be done continuously. 2. Get fit like a pro athlete. 3. Lift people up versus tearing people down. 4. Protect your good name. An impeccable reputation takes a lifetime to build. And 60 seconds to lose. 5. Surround yourself with positive, ethical people who are committed to excellence. 6. Remember that even a 1% daily innovation rate amounts to at least a 100% rate of innovation in 100 days. 7. Believe in your dreams (even when others laugh at them). 8. Measure your success, not by your net worth but by your self worth (and how happy you feel). 9. Take an intelligent risk every 24 hours. No try - no win. 10. Read "Buffett: The Making of an American Capitalist" by Roger Lowenstein. 11. Watch "Man on Wire". 13. Remember that business is all about relationships and human connections. 15. Say "thank you" more. 16. Know your Big 5: the five things that need to happen by the end of this year for you to feel its been your best year yet. 17. Read your Big 5 every morning while the rest of the world is asleep. 18. Read "As You Think" by James Allen and Marc Allen, at least twice this year. 19. Be willing to fail. It's the price of greatness. 20. Focus less on making money and more on creating value. 21. Spend less, save more. 22. Leave everything you touch better than you found it. 23. Be the most positive person in every room you're in. 24. Run your own race. 25. Stay true to your deepest values and best ideals. 26. Write a handwritten thank you note to a customer/friend/loved one every day. 27. When you travel, send love letters to your kids on hotel stationary. In time, they'll have a rich collection to remember your travels by. 28. Read "Atlas Shrugged" by Ann Rynd. 29. Be a problem solver versus a trouble maker. 30. Rather than doing many things at mediocrity do just a few things-but at mastery. 32. Commit to doing great work whether anyone notices it or not. It's one of life's best sources of happiness. 33. Give more than you receive (another of the truths of happiness). 34. Have your 1/3/5/10/25 years goals recorded on paper and review them weekly. 35. Be patient. Slow and steady wins the race. The only reason businesses that went from zero to a billion in a year or two get featured in magazines is because 99% of businesses require a lot more time to win. 36. Under promise and then over deliver. 37. See part of your job as "a developer of people" (whether you work in the boardroom or the mailroom). 38. Wear your heart on your sleeve. When people see you're real, they'll fall in love with you. 39. Be authentic versus plastic. 40. Read "The Alchemist" by Paulo Coelho. 41. Remember that life wants you to win. So get out of your own way. 42. Consider that behind every fear lives your next level of growth (and power). 45. Rest when you need to. 47. Write your eulogy and then live your life backwards. 48. Demand the best from yourself. 49. Remember that the more you go to your limits, the more your limits will expand. 50. See everything that happens to you as an opportunity to grow (and therefore, as a precious gift). 51. Be obsessed with learning and self-development. 52. Become comfortable alone (you are the only person you get to be with your whole life). 53. Smile. It's a stunningly effective way to win in business and life. 54. Reflect on the shortness of life. 55. Be bold when it comes to your dreams but gentle with those you love. 56. Remember that success is dangerous because it can kill drive/innovation/passion and going the extra mile. Be successful yet stay hungry. 57. Read "The Autobiography of Benjamin Franklin". 58. Be of deep value to this world. 59. Own beautiful things but don't let them own you. 62. Don't complain, gossip or be negative. 63. Plan as if you'll live forever but live as if you'll die tomorrow. 64. Feel free to pass these lessons on to those you want to help. 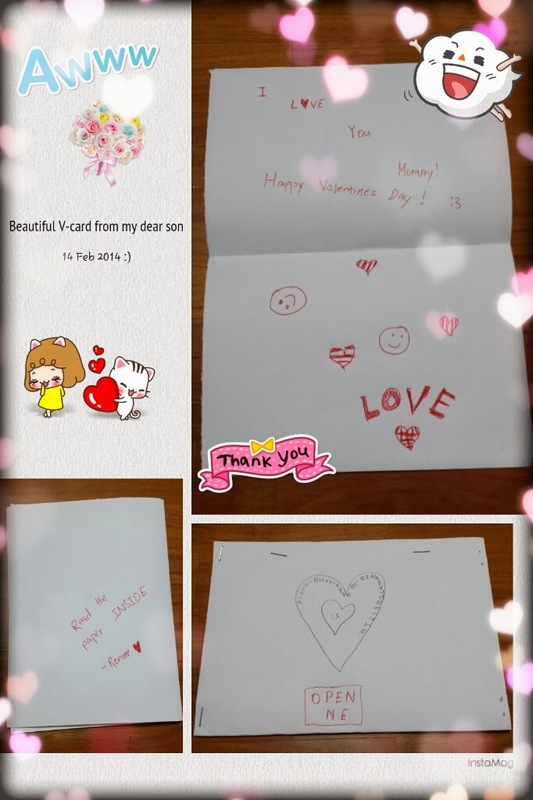 Almost every year he would give me his handmade card on special occasion, such as: Mother's day card, Birthday card, and this time, Valentine's Day card. I didn't expect he would give me one this year. Thank you Baobei! Thank you, thank you and thank you! My mom commented, "No wonder you love him so much although he wasn't performed great at school." Haha... Then she added, "Perhaps after this you will increase the amount of his pocket money." She continued laughing. I answered her immediately, "No, no... It wasn't me who gave him a pocket money. It was his dad." But I could really feel his love towards me. These past weeks he always came to my room after we finished dinner. He told me, "I love staying at your room. The air-con is cold but isn't too cold. I love your big bed too, plus so many pillows over it. But most importantly, I love to accompany you..."
Ssshhhh... it was his last sentence that melted my heart. He was obedient too lately when I asked him to leave his mobile phone inside my room instead of putting it inside his room. I asked him to do so since I caught him one time sleeping late and 'like' his friend's photo in Instagram - at about 11pm - where he bid me good night at 9.30pm. As usual, he would come in and out of my room repeatedly to hug, say 'I love you Mummy', have 'our style' kisses, and say 'good night Mummy' before finally went back into his room and went to sleep. 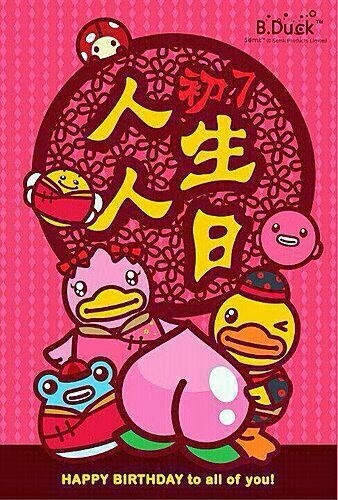 The Lantern Festival or 元宵节 occurs on every 15th day of the first month of lunar calendar. 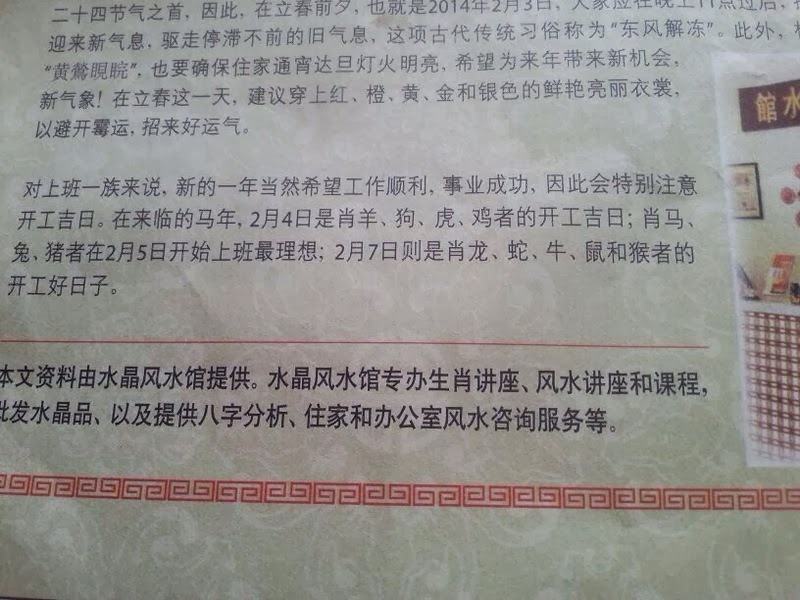 It also marks the end of the Chinese New Year's day. This year it falls on Feb 14, 2014, which is today. Time flies, isn't it? So how was your Chinese New Year's days? 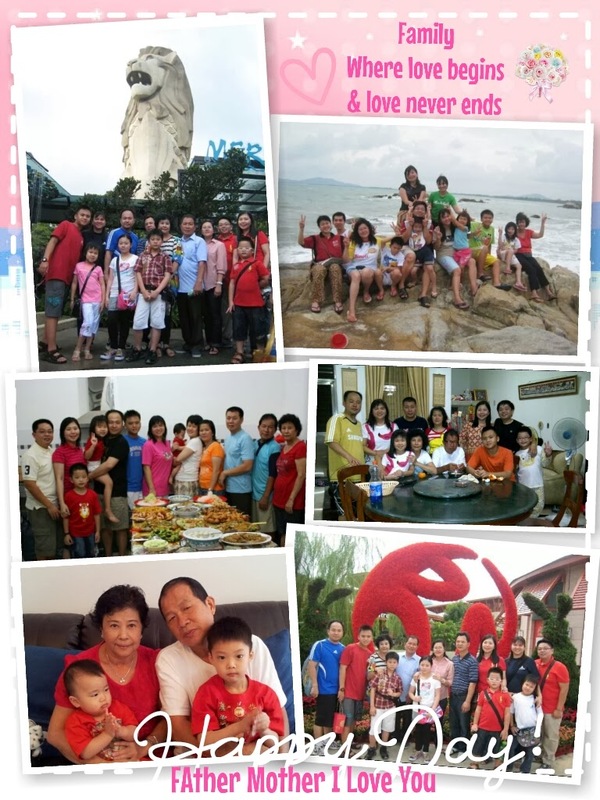 Hope all of you enjoyed it to the fullest, seized the chance meeting up with family members, relatives, and dear friends. Lolx! I think for those who attended the Chinese New Year gathering with relatives would find the above conversations sounded very familiar. Since its more often or not the once a year gathering, seemed that they needed to update their information and not to be the last to know. 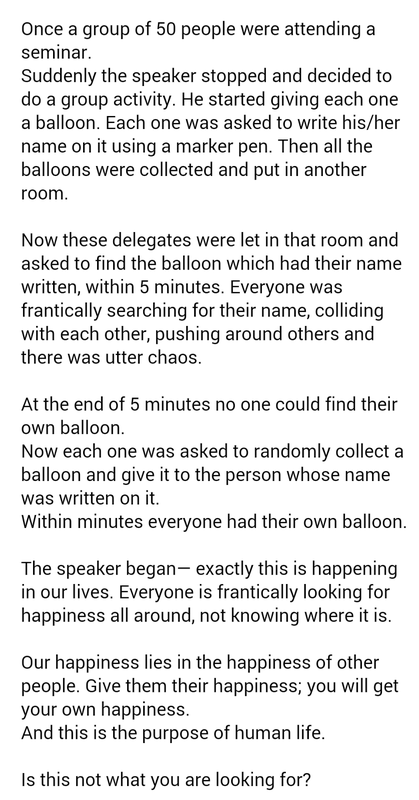 I often heard my friends grumbling and there were some people even trying to find an excuse not to attend the gathering just to avoid such questions. It's pity no? 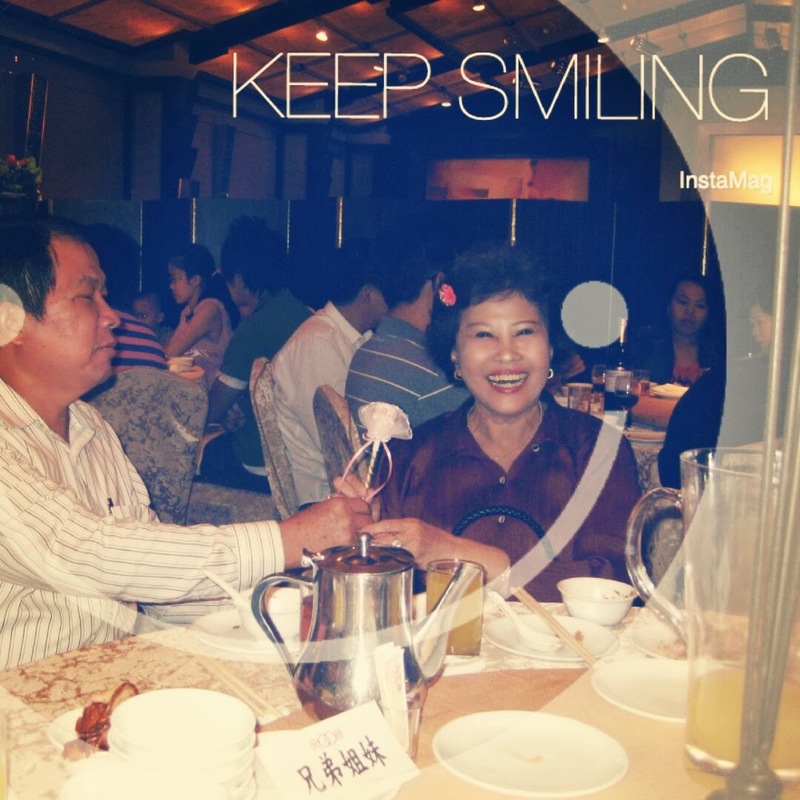 It's supposed to be a happy family gathering rather than being bombarded and reminded of unhappy occasions, if any. Any plan for this year Valentine's Day?? :) Many people applied leave or day-off today as it falls on Friday ^^ People can have a great long weekend to celebrate this special day with their loved ones. 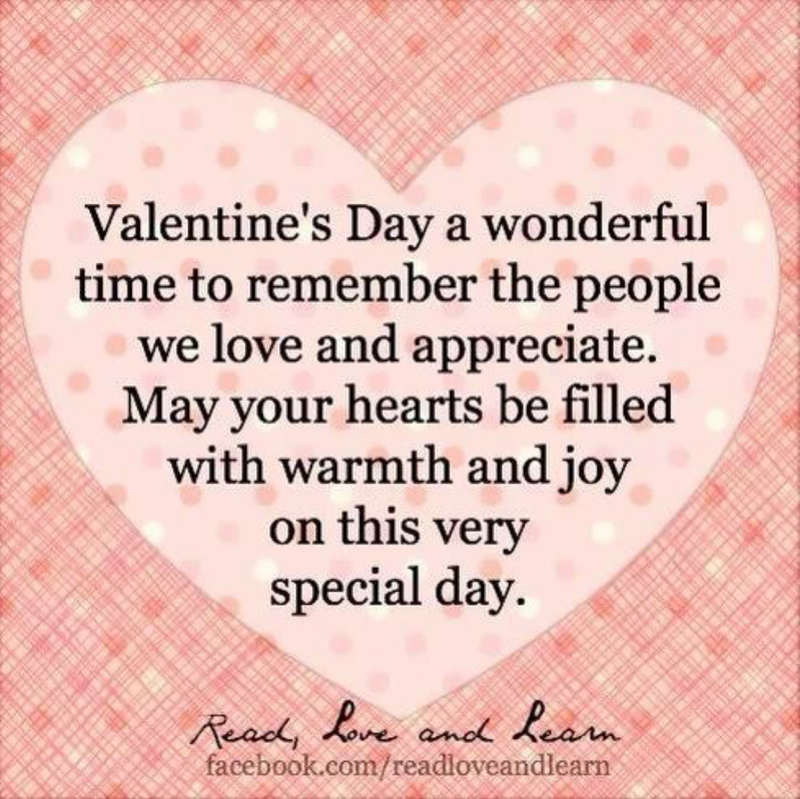 As for me, my hubby always says, "Everyday is a Valentine's Day" hehe... Therefore, every day is a loving day for both of us. However, every year he would give me at least a stalk of rose, usually was hidden inside my cupboard (as he knew first thing I would do after reaching home was to take my clothes and take a bath), plus some small gifts to represent his love and care for me :) Anyway, I never expected to receive anything from him as everyday love and care was much more than enough for me. Thank you dear! So, Happy Valentine's Day everyone! Hope you enjoy this special day and be happy always! Congratulations for those who managed successfully to propose someone as girlfriend or as a wife today, hope both of you can have a long journey together as a loving couple :) Have a wonderful day everyone! Today it signifies the years they have been together. Both of them have gone through lots of ups and downs these past 45 years. Wow, almost half century!!! 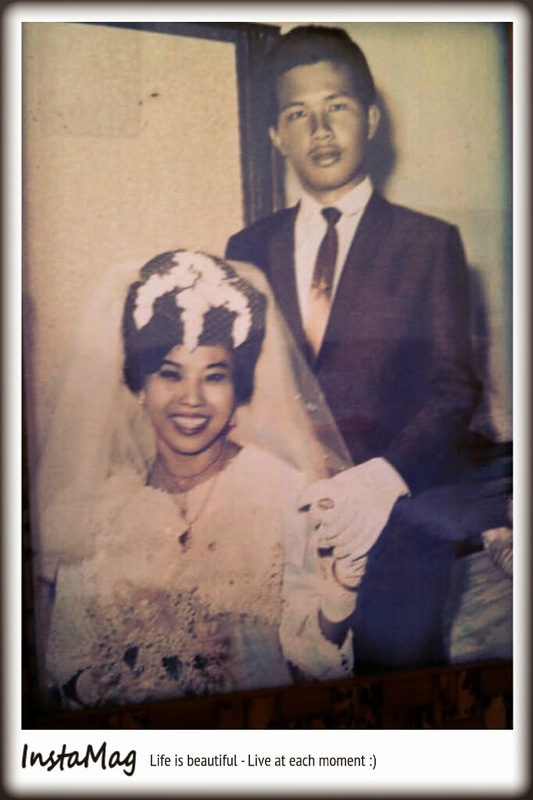 My handsome Pa and beautiful Ma were born at different islands in Indonesia as all my grandparents settled at different places from mainland China many years ago. They both came from quite a big family. They met each other in the capital city, Jakarta, a place where I was born and grew up. The houses that they both stayed were located not far from each other. Called it fate? Or destiny? My father was 22 years old while my Mom was only 18 when they both got married. 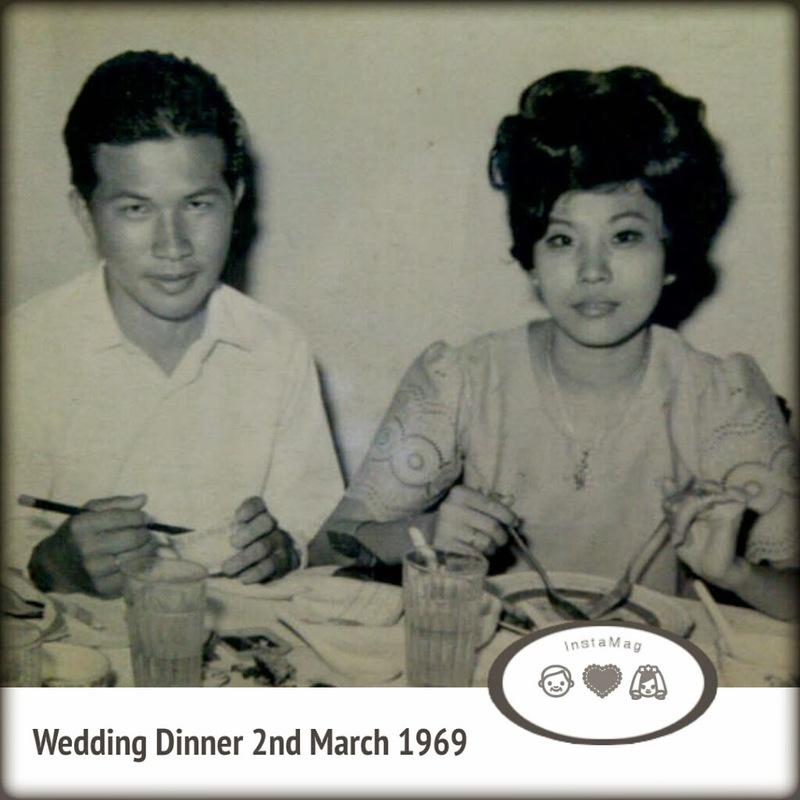 My brother and I followed our parents’ step of getting married early (although not as early as our Mum), as we would love to remain young by the time our children had grown up hehe… Not long after they got married, my Mom got pregnant and my eldest sis was born. Just like any other Chinese family, my parents hoped for having more sons in the family and they finally had my brother as a third child. But it wasn’t enough. My mom kept trying and until the last one came out, which was me, who was another baby girl. Only then they decided to stop. By that time, I was the fifth in the family. My Mom has spent most of her time as a full-time housewife. She took care of a shop before but Pa preferred her to take care of us instead. What a right step and sacrifice that my Mom took, and all because of us, the family. Pa moved out to the capital since he was still a teenager. He had to work out and help out to develop my grandpa’s shop in the island where he was born. He had other ten siblings in the family. Although he wasn’t the eldest, he held a very big responsibility to take care of the family. I am very proud of him. In my eyes, he is the wisest, the most responsible father and brother, the most generous person, and the most loyal I’ve ever known. His love for my Mom is never ending. Since the day he fell for her until now. They both have gone through the thick and thin together, with us among their colorful life journey. We are so proud of both of you, Pa and Ma! Happy 45th Anniversary once again. Wish you both blessed with a very good health, life full of joy, love and happiness!!! Love you both always!!! I think it wasn’t just me. I’m sure many of you have taken blogging as different kind of platform in life to connect with others who come from or live in different countries, from different age, different background, and so on. From there, it slowly develops into friendship, which at one point of time, you may meet up with each other and develop the real friendship, not just a mere online friendship (if you’re lucky enough to meet someone who clicks with you, as most bloggers will have similar hobbies, such as: reading, writing, traveling, photography, and so on). 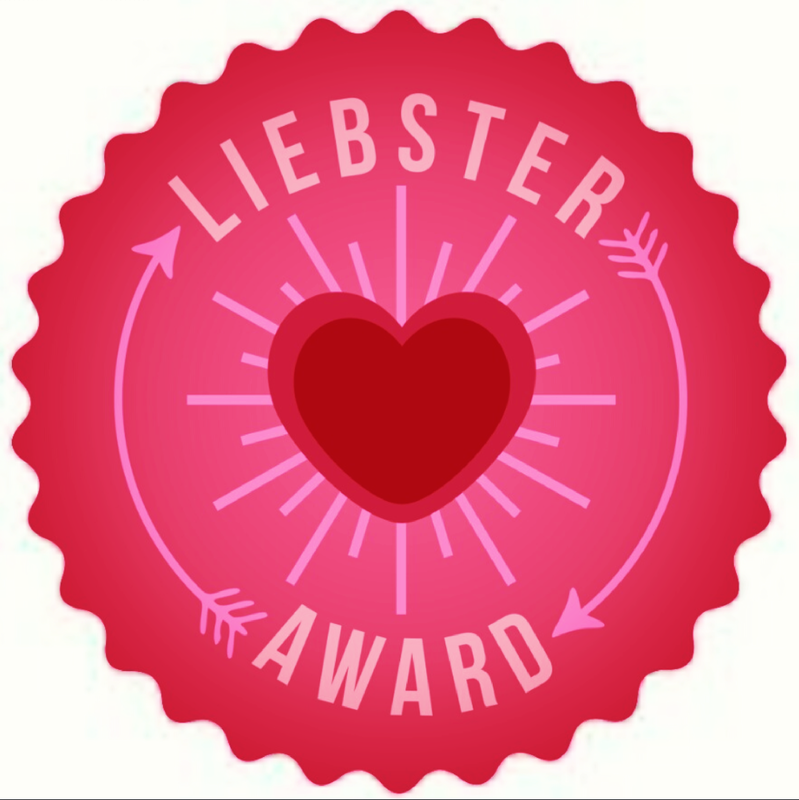 Btw, for those who have never heard about “Liebster Blog Award” before, “Liebster” comes from German word, means “dearest”, and Liebster Award is a kind of nomination given to the other bloggers, where the nominated person has to: First, thank the person who nominated you; Second, answer the 10 questions given; Third, nominate other 3-5 of your favorite blogs that have fewer than 200 followers and let them know about their nomination via a comment or message; and lastly, to come up with 10 questions for your nominees to answer. - For me, blogging is more on personal expression towards something. It’s a space for me to hold onto the beautiful memories, beautiful lessons to learn, gratitude feeling, inspirational, which may connect to others who love the same thing. - I started blogging in Nov 2004, which was almost ten years ago. When it started, it would be mostly about my feeling towards exams. Going back to school after getting married and having a child wasn’t an easy task and I often vented my frustration through this blog. Slowly, the topic changed into anything that related to what I’d seen, what I’d felt, and what I’d encountered throughout my life journey. - Myself. I will first convince myself to cheer up and smile, as I believe that “happiness comes from within” and “we are the creator of our own happiness”. I will take my time alone sitting down by the river, one-hour cycling, doing yoga, jotting my feelings down into a journal, and so on. If after doing all that my mood still hasn’t changed, I will talk it out with someone who knows the problem that I face with, which can be my hubby, third sister or my buddies. - His Holiness the 14th Dalai Lama – I want to learn few things in life from him and just to feel his presence I will have already been so grateful and feel blessed!!! - Hurtful but necessary to know. It’s better to be hurt rather than living happily in disguise. 1. IRelateToThat - A twenty something civil servant currently staying in Thimphu, Bhutan, Rekha Monger is an independent woman, who loves to stay at home, drink tea and read her favorite books. She is a passionate reader and can write beautifully. Knowing her not so long but I know she deserved this Liebster blog award. She often inspires others to blog, such as: to list the 100 things I love, Q&A on blogging and blogger’s tag, etc. 3. 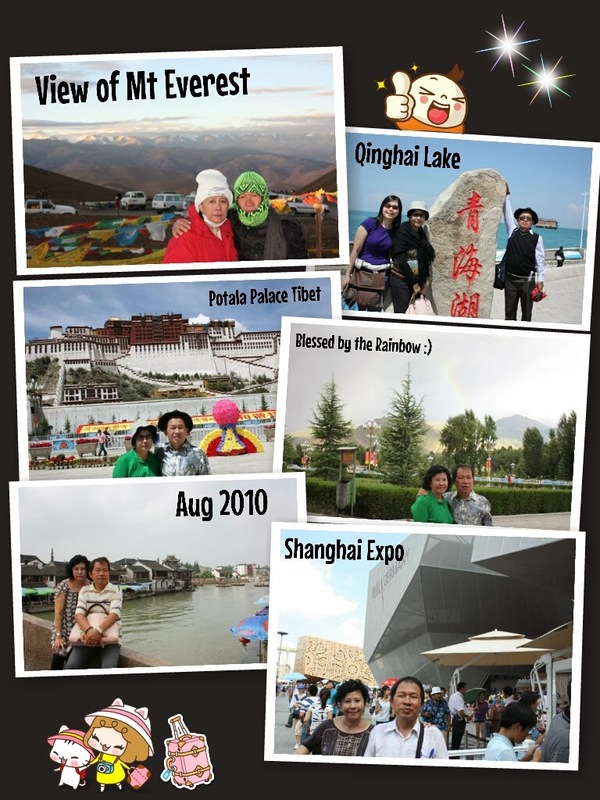 Sangay Cholden’s Random Thoughts - A passionate blogger who loves writing and photography. He is in final semester of his college’s time, also studying in Phuentsholing. 3. What kinds of blogs do you like to read and follow? 4. What is something you wished more people knew about you? 6. Who is the one person who knows you inside out and will always be there for you? 8. If there was one thing you could change about the world, what would it be? 9. If you had a day all to yourself, what would you do? 10. Favorite food and why? 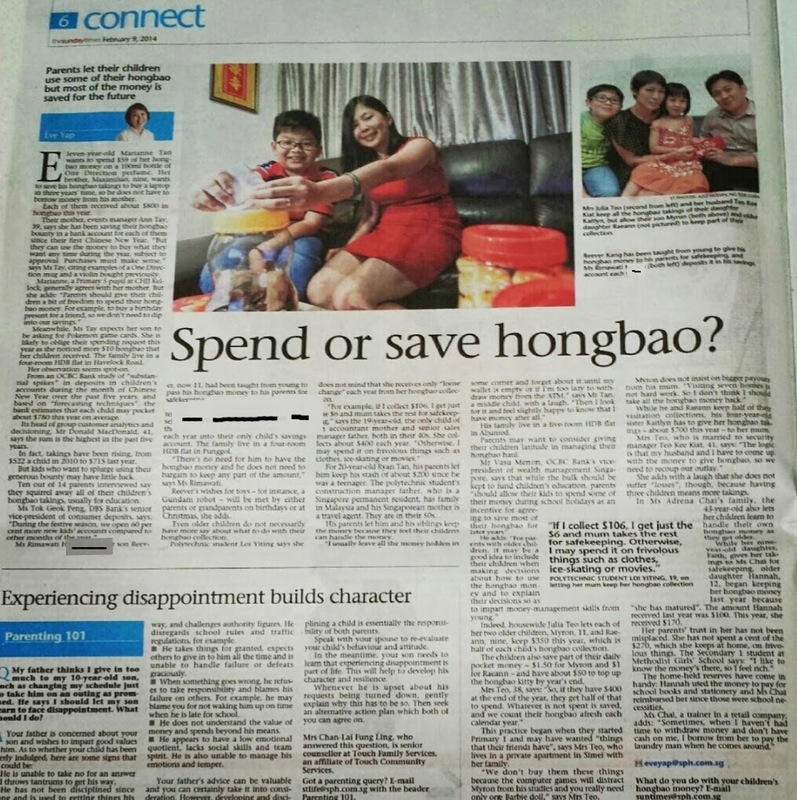 I read in mypaper.sg regarding "$780 and counting as kids bag fat Hongbao" beginning of this week. 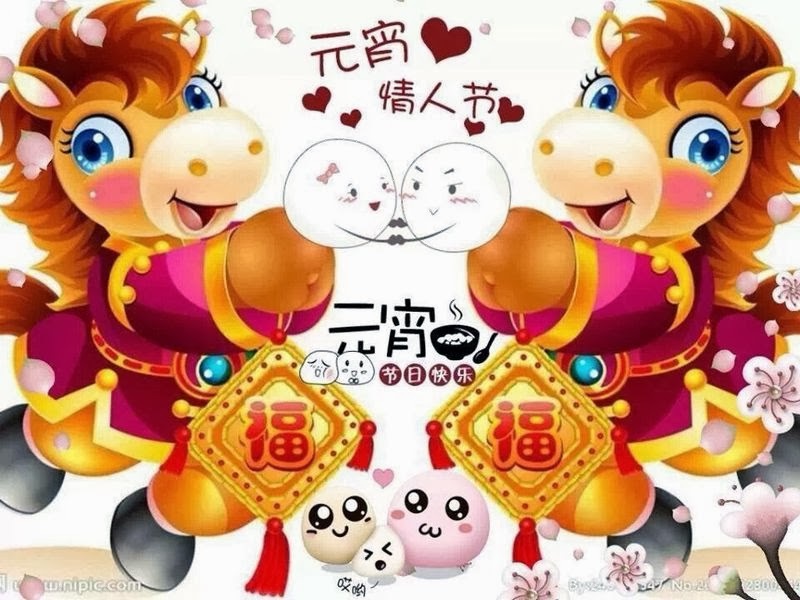 During Chinese New Year (first two-week of lunar calendar), those married individuals distribute Hongbao to single unmarried individuals, which filled with crisp new notes inside. The amount will vary from person to person, depending on the relation between the giver and the receiver. The closer the relationship, the more generous amount usually given or received. Also, the amount will be in even numbers, e.g. $2, $6, $8, $10, $20, and so on as Chinese believes that even numbers represent that things will be well rounded. $4 is the exception and avoided as it brings similarity to the word 'death' in many dialects. 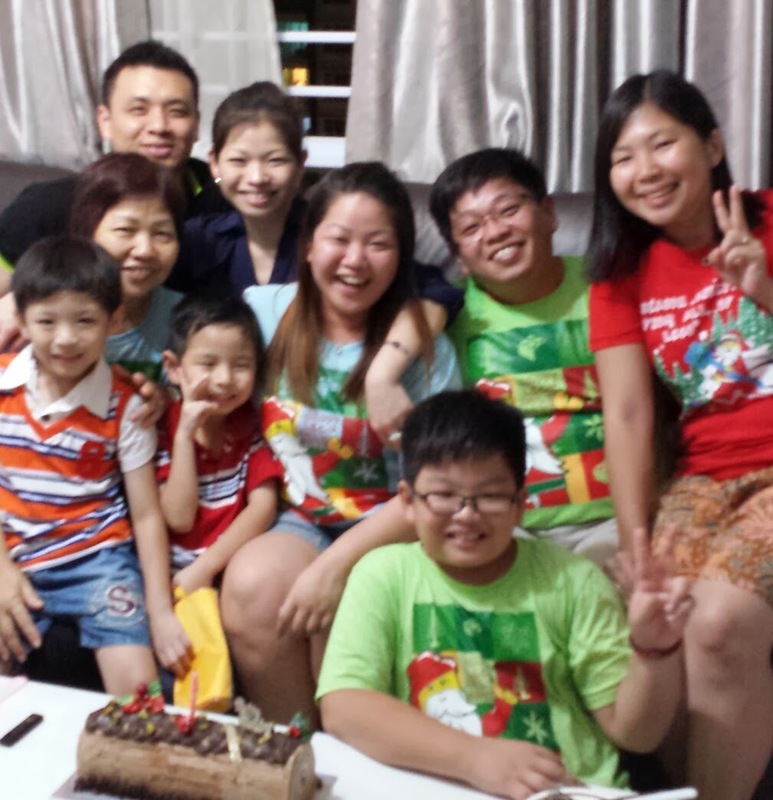 In Singapore, it is common to receive Hongbao with a minimum amount of $6 and as high as $20 among relatives. Again, it may differ as people's financial situation differs from one to another. In Indonesia, grandparents are usually the ones who will give the most, followed by parents. Close relatives will give quite a lot too. Again, this may differ according to the financial capabilities. On the same day I read about the article, that afternoon my colleague called and asked me if I was willing to be interviewed by the Straits Times (our local newspaper) or not. Since I was free and the topic seemed general, so why not? I was informed that there would be a photo-taking session too. Hehehe.... I accepted the offer almost immediately Lolx! So my colleague sent the information to the reporter and the reporter interviewed my son and I through telephone. 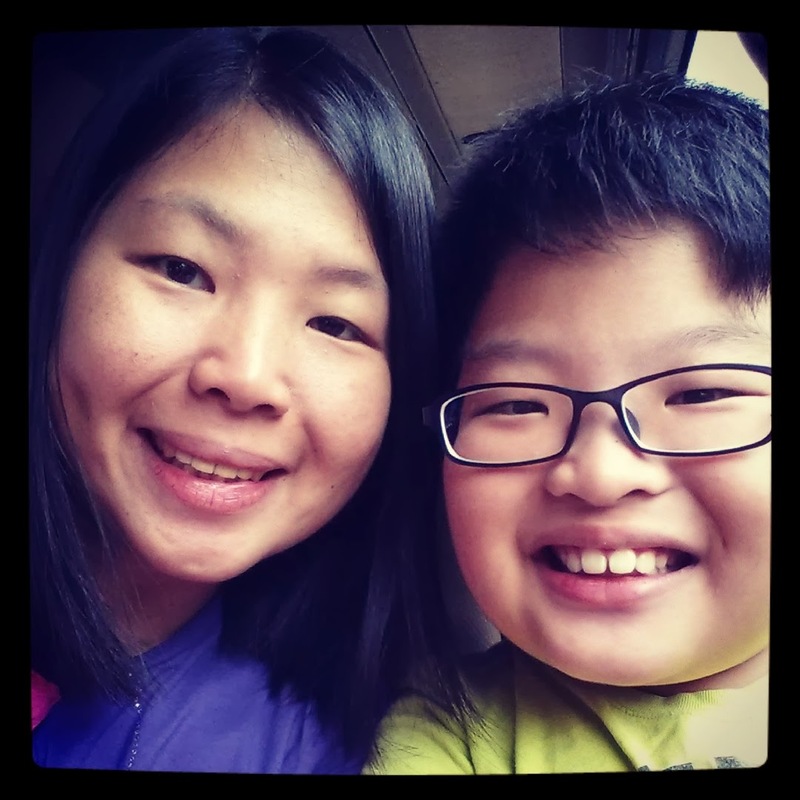 She wanted to know what did I do with my son's Hongbao money after being collected each year. The answer was simple: I put all the amount inside his bank account. 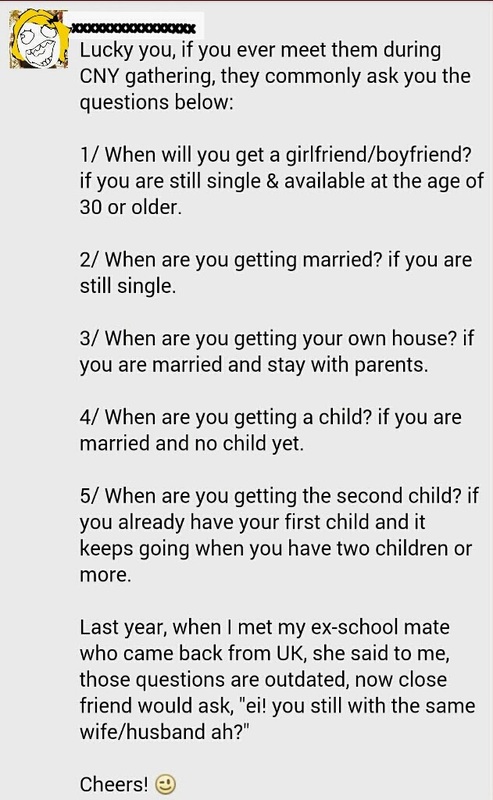 She was wondering though, if my son ever asked any amount from the Hongbao from me so that he could use that money to buy things that he likes. I said, so far, no. He never demanded that all along until now, when he reached 11 years old. When asked what would I do with the money, I said it's for safekeeping or maybe one day he might need it for future use, e.g. education, etc. He didn't ask for the money because he also got things that he wanted during his Birthday or Christmas. In fact, he was quite concerned and protected his money of being used when we jokingly asked him to treat us dinner or buy gift using his saving. He would immediately answer "no". Lolx! The author's name sounded very familiar to me. I used to have a colleague who had the same name as him. Hahaha... So I heard about his name many years ago but only recently I managed to read one of his four books. Finally! 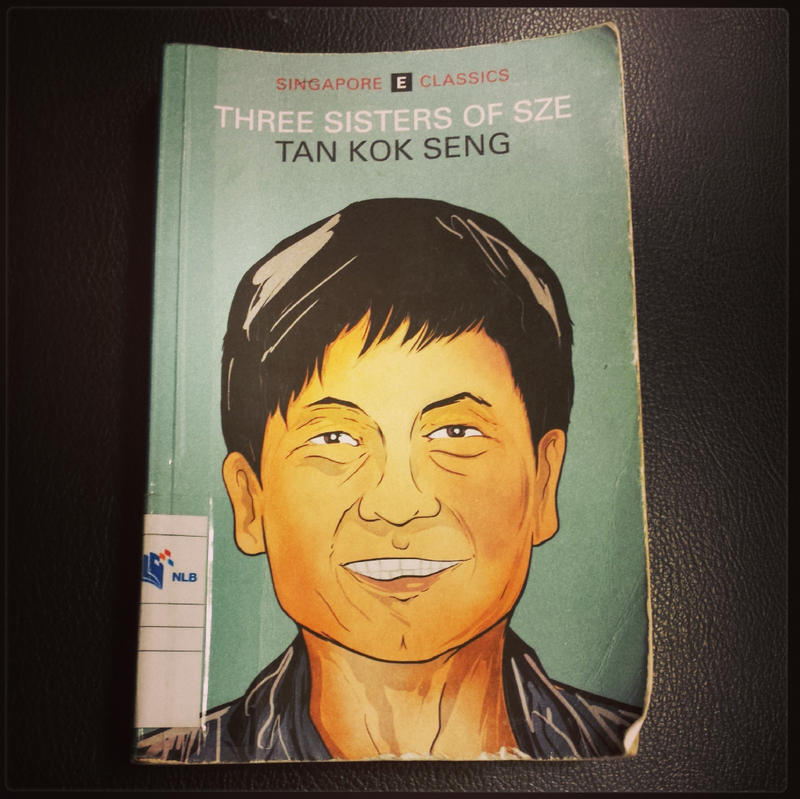 This book was about Sze family. 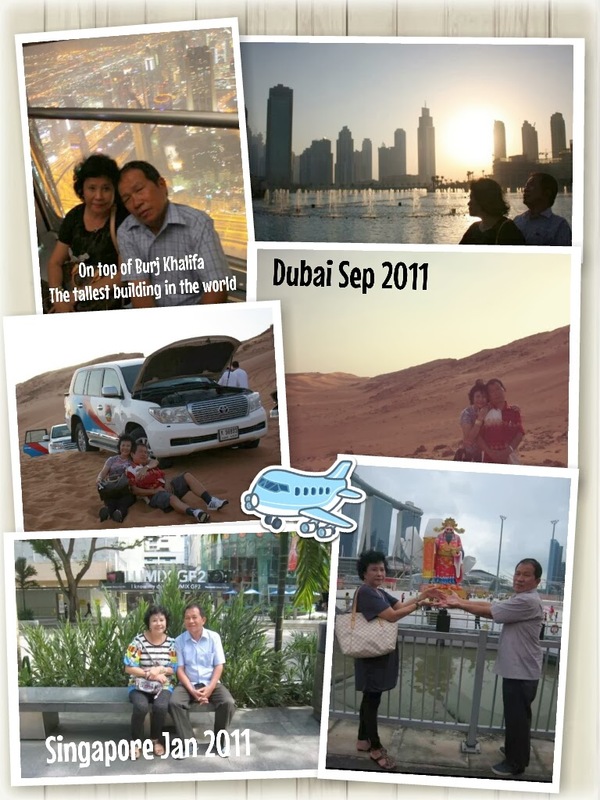 Mr Sze's parents came from China. His father came and started from scratch, nothing, zero. 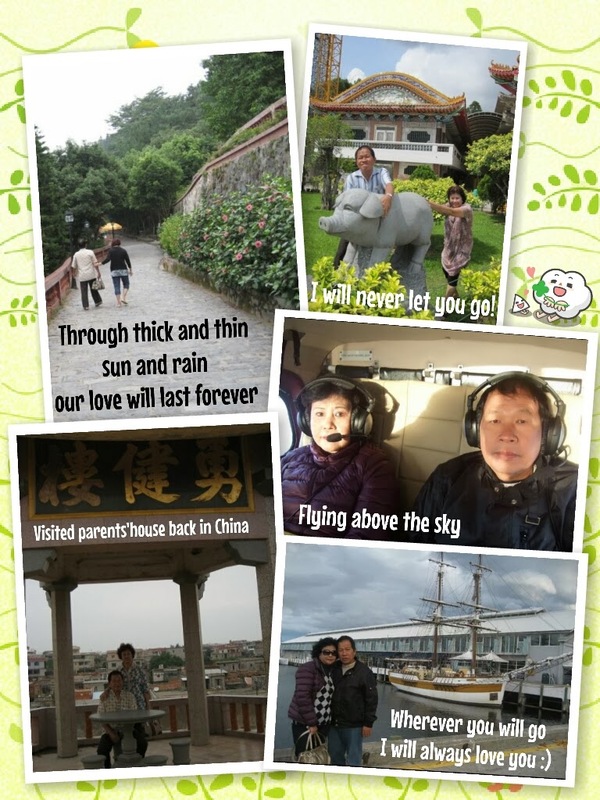 With hard work and perseverance, Mr Sze's father slowly managed to bring his wife and parents to Penang. However his parents couldn't stand the lifestyle in Penang and went back to China, while he and his wife remained settling down in Penang. Mr Sze was born in Penang and was Western educated. Later on he got married, had three daughters, and lived happily until one day his wife was addicted with playing Mahjong with her neighbors. Their three daughters ended up growing up without parental guidance or love while their father was having an affair outside as a result of being neglected by his wife. The story was easy to read and flew very smoothly. I loved reading it! It reminded me of my grandparents and my father's background. How familiar I felt although they did different things in life and of course, we (my siblings and I) weren't raised like that. From the story, I learn something. I realized that happiness and unhappiness in the family would depend on the quality of thinking and attitudes of the people who lived inside. As every human being carried different background, had different thinking and goals in life, different dreams and expectations, then disagreement might happen at anytime. But if everyone had the same goals, mainly to retain peace and harmony within the family, automatically their lives would be in peace and harmony too. That's why we often heard the clash between the wife and mother-in-law, or with other in-laws who stayed together with them. When I joined the briefing yesterday outside my boss' office, they were talking about the color of the clothes that we were all wearing that morning to start our first day at work in the Wooden Horse year. The color of cloth that I was wearing seemed matching with what they said. Oopss.. I didn't know that they also believed on this! A week ago my buddy sent me a scanned newspaper's cut above through what's app, which saying that by wearing a certain color of cloth to work on a particular date would give us good luck. It was also mentioned there on which day you have to start your work in order to have a smooth work throughout the year. E.g. 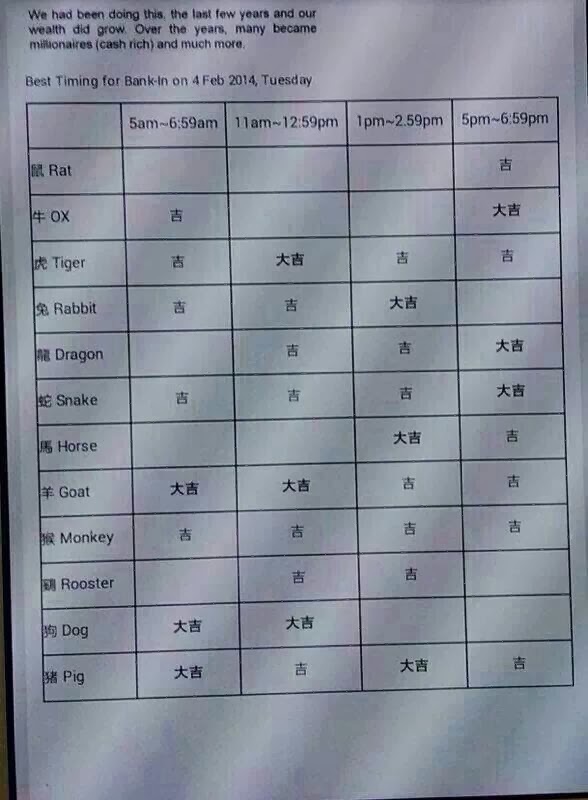 Goat, dog, tiger, and rooster to start work on 4th Feb; Horse, rabbit and pig zodiac to start work on 5th Feb, etc. Today is Li Chun. 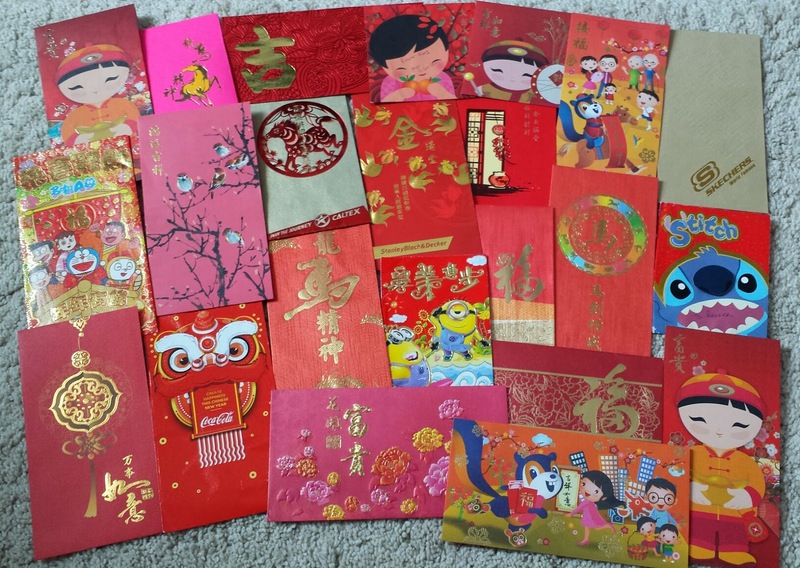 People was advised to wear red, orange, yellow, gold or silver color cloth to invite good luck. Since I had red color top, no harm on just following what it had said. However, most of us couldn't follow the advise on the starting day of work since we worked at Fin dept and we had to go to work on Monday to do our month-end closing. Lolx! Generally people here (especially Chinese race) were very superstitious. Most of us would blindly believe to do what it's said to be good for us although we were not sure who wrote that and based on what. Today there was another interesting incident that made me even wonder, were we overly superstitious??? When I saw my Zodiac, it's said would be very good to bank-in from 1 to 2.59 pm. But my lunch time had already over so I thought of ignoring it. Suddenly my buddy sent the list into our group chat. I told them that I wouldn't go as my lunch time had already over and my toe was hurt on Sunday when cycling so I couldn't walk far. Then my best friend said, "OC, your time hadn't over yet. You still can bank-in until 6.59pm." I still remained quiet. Then she said again, "OC, go bank-in la! So long you bank-in today." I knew she meant good. She wanted me to have good things happen in my life :) Finally I said, "Ok la," and I gave in. She left her colleague and decided to accompany me to the bank. (She was the same person who asked me to bank-in some money just now). We both walked there. Wow, there was quite a queue there on the deposit-cash machine. Everyone was queuing on the same machine. Wow! Again, I wasn't the only one who was superstitious! I had to queue for some time before my turn came. Luckily my friend was there. We both chit chatted while waiting. 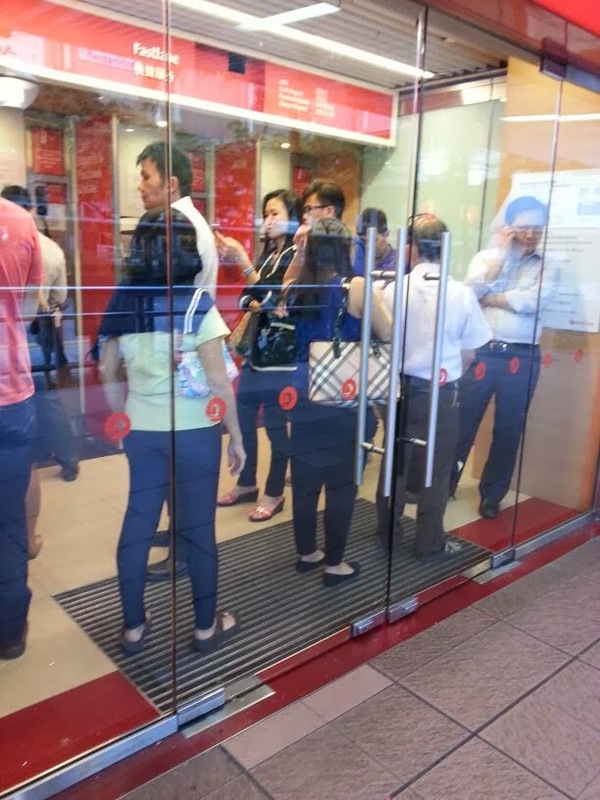 Usually not many people used the deposit-cash machine as more people queued for the ATM or withdrawal machine. Suddenly she sent me message saying that the queue for the deposit-cash machine at shopping mall nearby her house was super long! I asked her to help me taking pictures if she was still nearby the area. Sekali she told me that she was going to queue again. Yalama! 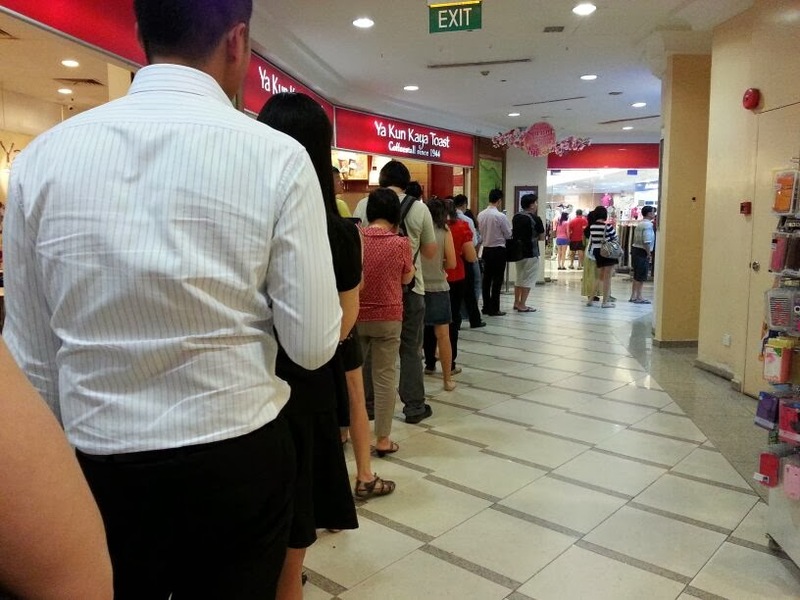 She had queued once in the afternoon leh... And now, despite the very long queue, she still wanted to bank-in some more cash? She replied me, "Cos want to make myself more "huat", tats y i decide to queue too." Oh my! The best thing was - after queuing up for 1 hour and 15mins, she couldn't bank her money in. She said the machine had gone haywire, couldn't take her money at all. She tried many times but the slot just didn't take her money. So she gave up as behind her there were still lots of people waiting for their turn. She said the Cisco officers even came again to collect the money from the machine there as it was too full and one of the deposit-cash machines was spoilt. I guessed due to too many transactions done in a day. Click here for the best time to bank in for year 2015.